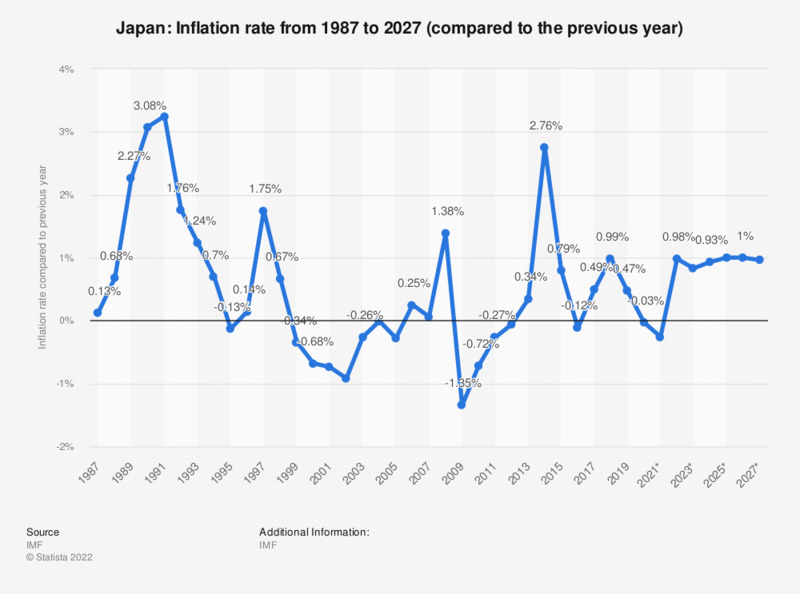 The statistic shows the inflation rate in Japan from 2012 to 2017, with projections up until 2022. The inflation rate is calculated using the price increase of a defined product basket. This product basket contains products and services, on which the average consumer spends money throughout the year. They include expenses for groceries, clothes, rent, power, telecommunications, recreational activities and raw materials (e.g. gas, oil), as well as federal fees and taxes. In 2017, the inflation rate in Japan was about 0.47 percent compared to the previous year. Among the countries with the largest gross domestic product / GDP, Japan is only outranked by the United States and China, making it the third-largest economy in the world. Apart from a few significant slumps in growth now and then, Japan’s gross domestic product has been stable for the past decade, and is mostly yielded by the services sector. Industry accounts for about 30 percent of Japan’s GDP; while a smaller contribution of 1.3 percent is generated by the agricultural sector. This is reflected in the economic sector distribution of the workforce in Japan; the majority of Japan’s workers are employed in services. Japan’s inflation rate, which can be seen above, is actually among the lowest worldwide. The country’s national debt in relation to GDP has reached dramatic levels over the years, and the budget balance in Japan in relation to gross domestic product / GDP has ran at a deficit at about 10 percent of GDP for the past few years. As for trade, Japan is among the leading export countries worldwide, and the leading import countries worldwide. Japan’s main export and import partners are China and the United States. Among other goods, the country exports mainly electronics, transportation equipment and vehicles, while imports mostly consist of fossil fuels, food and textiles. This, however, does not mean that Japan's economy is recovering anytime soon - its trade balance has been showing a steadily increasing deficit for the past few years as well.